The 2018 college football season officially began last week, and while our initial PFF ELO ratings did favorably well considering the outcomes of Miami-LSU, Northwestern-Purdue, Maryland-Texas and Michigan-Notre Dame games, we were able to get home on just one of our picks in Notre Dame against the spread. We got closing line value in three of our five picks and needed a 31-point fourth quarter for our UNDER 63.5 in UNLV-USC to miss by half a point. Alas, on to this week. Our models rely heavily on our aforementioned PFF ELO rating system for college football, and thus we continue to be optimistic as we head into Week 2. We also include situational information like crowd size and travel distance, along with opponent-adjusted information on things like PFF passing grades when clean. This week we’re all over underdogs again, with Pac 12 teams littered throughout the picks. After the aforementioned heartbreaker in southern California, we’re only taking overs this week as well. Point (Eric Eager): We’re going back to the well with an over on a sub-50 number. Unlike last week, both of these teams, with roughly 80 offensive snaps per game in the last season-plus, have the pace that is conducive to an over. Duke’s Daniel Jones was terrific against Army in Week 1, completing all but one of his passes traveling over 10 yards in the air, along with going 3-of-4 for 121 yards and a touchdown on deep passes. While Clayton Thorson struggled on a snap count in Week 1, his pass protection was terrific and Jeremy Larkin generated substantial success on the ground, with 143 yards on 5.5 yards per attempt. Let’s get some points. Counterpoint (Ben Brown): Northwestern jumped out to an early lead, scoring 31 points against Purdue in the first half before slowing their pace to a crawl. Their coverage unit was exceptional, allowing a minuscule 66.2 passer rating on all throws and generating an expected points added on pass defense of -0.48 (best in the Big Ten). Duke rolled through Army in Week 1, facing twice as many run plays as passes. They did struggle in coverage, allowing 9.9 yards per reception. Taking game flow into account, the thought is that the Duke defense sold out to stop the run, allowing a few big plays in coverage when they were up big. Point (Eric): South Carolina made it into the Top 25 of our PFF ELO rating system for the first time this week, and for good reason. Jake Bentley was terrific against Coastal Carolina, generating two touchdown passes on throws traveling more than 10 yards downfield, and Shi Smith complemented Deebo Samuel with 61 yards through the air, 31 of which were picked up after the catch. If they are going to slow Georgia they will need to generate more than the eight pressures they got last Saturday. Jake Fromm only had to throw four passes beyond 10 yards in the air in a 45-0 victory Saturday against Austin Peay. Saturday will be his first real test this season. Counterpoint (Ben): Picking against our third-ranked PFF ELO team on the road is concerning enough. Not much can be gleaned from their Week 1 matchup other than they may continue to get Justin Fields snaps earlier than expected. Whichever quarterback is playing, the concern for South Carolina is how badly they performed in coverage last week. Some of the stats occurred in garbage time but they allowed a 106.7 passer rating to a quarterback who graded below average according to PFF passing grades in 2017. South Carolina also allowed a successful pass on 68.75 percent of dropbacks. If they want to cover the spread against one of the best teams in the country, they’ll have to b,e elite not adequate in coverage on Saturday. Point (Ben): Brian Lewerke was exceptional in Week 1 posting a passer rating of 115.5 when kept clean. 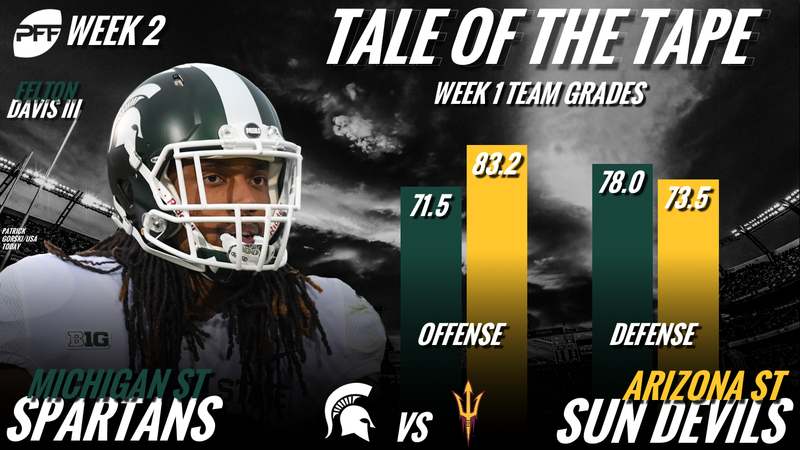 50 percent of his dropbacks were deemed a success from an EPA standpoint and he stepped up big when he needed to most and the Michigan State offense played at a breakneck pace in 2017 with 79.8 offensive snaps per game. For Arizona State, Manny Wilkins had quite possibly the most impressive passing performance of any quarterback in Week 1. He was nearly perfect when kept clean from pressure, posting a passer rating of 156.3 and having a successful pass on 57.89 percent of dropbacks. With both quarterbacks looking elite to start the season, our model projects the points to roll in Week 2. Counterpoint (Eric): Granted it was against UTSA, but the Sun Devils generated six sacks, one quarterback hit and a whopping 24 hurries on Saturday night, allowing just 5.7 yards per pass in the process. While I love the possibility of them being able to generate turnovers (and the over-inducing short fields they elicit) against Lewerke, turnovers are hard to count on, and turnovers that result in scores even more so. Michigan State will have to block better in both the ground game and in protecting Lewerke for this over to be as sure as our model says. Point (Ben): Going back to the well with USC after a tough beat on their over in Week 1. JT Daniels had flashes in their win over UNLV with 28.2 percent of his throws receiving a positive grade. He minimized his mistakes and took shots when he needed to. The USC defense left a lot to be desired especially in run defense in Week 1. Our model does not overcorrect due to a one-week performance as they are still the 11th-best defense in the country according to our PFF ELO model. They were exceptional in pass defense, posting 20 total pressures and allowing an EPA of -0.51. The Stanford offense had a successful rushing play on only 7.41 percent of attempts and they averaged 1.9 yards per carry in their Week 1 win. If USC’s pass defense performs as well as they did in Week 1, they should have no issues covering the 5.5 points on the road. Counterpoint (Eric): I’m still a little perturbed by the fact that USC allowed 21 points and over 300 yards rushing to a UNLV team last Saturday en route to their over. Be that as it may, a concern is some shaky play of Daniels, who completed just 5-of-11 intermediate passes for 69 yards, with some turnover-worthy plays in the process. If he struggles against Stanford’s defense, will they be able to keep up with a Cardinal offense that was able to eat, despite generating success on just seven percent of their early-down run plays against San Diego State, due to the brilliant play of J.J. Arcega-Whiteside? Point (Eric): I think this is a substantial overreaction to an impressive road victory by BYU against an Arizona team that rings in at just 74th in our PFF ELO rating. California is a more-stout 60th, meaning that (on that alone) they would be clear favorites over a team like BYU on a neutral field. There are still tons of questions about BYU’s offense, with Tanner Mangum grading very poorly against Arizona. He was especially bad in the intermediate area, failing to complete a pass between 10 and 19 yards. Linebacker Evan Weaver (12 stops) and the California run defense should be able to handle the other dimension of BYU’s offense and give them a chance to win this one. Counterpoint (Ben): BYU gained 183 yards on the ground with 88 yards after contact in Week 1. They rolled over Arizona and if wasn’t for two fourth-quarter touchdowns, the game would have been even more one-sided. Their coverage unit allowed a 50 percent completion percentage and no throws were caught more than 20 yards downfield. They had five pass breakups and completely locked down the Arizona offense until the game was out of reach. The market may have overcorrected based on one game but this will still be a hard fought game to cover on the road for California.